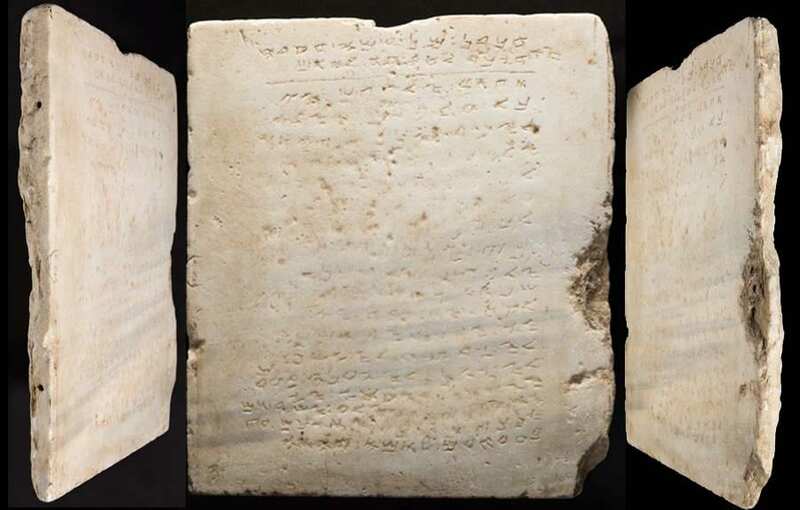 The earliest-known stone inscription of the Ten Commandments will be offered November 16, 2016 by Heritage Auctions in the Living Torah Museum Auction in Beverly Hills, California, Art Daily reported Tuesday. The tablet is the centerpiece of an offering of Bible-related historical artifacts, researched and authenticated, property of the Living Torah Museum in Brooklyn, NY. The opening bid on the Ten Commandments is $250,000. David Michaels, Director of Antiquities for Heritage Auctions, suggested “there is nothing more fundamental to our shared heritage than the Ten Commandments.” The two-foot-square marble slab, inscribed in early Hebrew script, probably came from a synagogue destroyed by the Romans between 400 and 600 CE, or by the Crusaders in the 11th century, according to Michaels. Weighing about 200 pounds, the slab of marble is chiseled with 20 lines of script, in Hebrew and Aramaic. 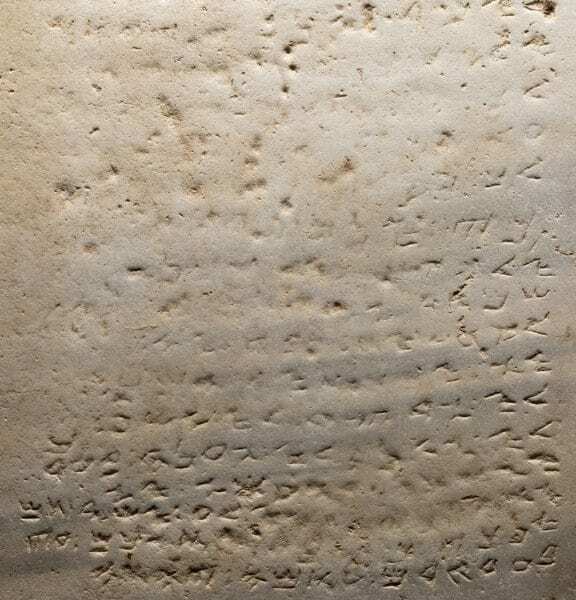 After an introductory dedication and invocation, it lists nine of the ten commonly known Biblical Commandments from the Book of Exodus, omitting the “You will not take the name of God in vain,” and adding instead a commandment commonly cited by the Samaritan sect, calling on the worshipers to “raise up a temple” on Mount Gerizim, sacred to the Samaritans, near the city of Shechem. Bidders are required to agree to place the object on public exhibition, as per a stipulation by the Israel Antiquities Authority, which designated the artifact a “National Treasure” of Israel. Samaria was the home to of the Samaritan sect, known by Jewish tradition as the “converts by lions,” based on an account of their forced immigration under Assyrian rule from an unknown origin, and their embrace of the local Jewish God for protection from the lions that roamed their new habitat. Scholars who studied the carved letters believe the stone was carved in the late Roman or Byzantine era, circa 300-500 CE, to adorn the entrance to a Samaritan synagogue. The discovery of the Ten Commandments Stone was reported in 1947 by Y. Kaplan, the stone’s owner at the time, and Yitzhak Ben-Zvi, later Israel’s second President (1952-1963). It was first uncovered in 1913 during excavations for a railroad station near Yavneh, Israel, and was acquired by an Arab who set it in the floor of his courtyard. Over many years, foot traffic wore down some of the letters at the center of the slab, although the forms are still discernible. In 1943, the stone was acquired by Kaplan, who brought in Dr. Ben-Zvi and other scholars to study it. Antiquities dealer Robert Deutsch purchased it in the 1990s, and Rabbi Saul Deutsch obtained it for his Living Torah Museum in 2005. It has been the centerpiece of the Museum’s collection since then and was subsequently published in Biblical Archaeology Review magazine and other publications. Although considered a “National Treasure” of Israel, the Israeli Antiquities Authority (IAA) approved its export the US in 2005 on condition that it be displayed in a public museum. “We seek either an institutional buyer or a private one who will agree to exhibit the Ten Commandments Stone so that all can see, enjoy and learn from it,” Michaels told Art Daily. The Living Torah Museum auction will include at least 50 other artifacts from the museum’s collection, including a nine-spouted ceramic oil lamp dated to the first century CE that is regarded by some experts as the earliest known first Hanukkah menorah, Michaels said.